Eastern Vilas and northeast Oneida county is well known as a thriving tourist destination for both families and anglers. 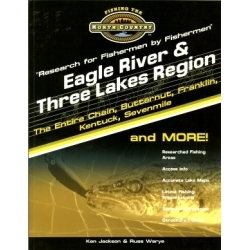 The Eagle River / Three Lakes Wisconsin area has been associated with good fishing and tourism for over 100 years. The variety of the fisheries within the boundaries of these towns is intriguing, both in the size of the lakes and the species that are found in them. Seasonal patterns in the fishing are fairly predictable in this area. Excellent spring panfishing, specifically crappie, bluegill, and perch are at the top of many angler’s lists that visit this region. Bass anglers have also discovered many productive waters here for both largemouth and small mouth. Good walleye fishing is found in both spring and summer with a fair amount of attention towards ice fishing after winter gets its grip on the north. Muskie anglers enjoy many lakes in this area beginning in June and efforts do not cease until the final bell on the last day in November. Many famous bodies of water are found in this busy section of the North County. They include Catfish, Eagle, Cranberry, Kentuck, Butternut, Big Stone, Long. Planting Ground, and Big. Most of these lakes offer superb access either through public boat launches or resorts with many amenities that can make a visit to this area a memorable one. This is a bustling area in the summer, but anglers still enjoy success due to the productivity of the lakes and care that has been extended in managing them. Some of the lakes included in this book are: Aldridge, Anvil, Big Lake, Big Fork, Big Stone, Boot, Bose, Butternut, Catfish, Cranberry, Crystal, Deer, Deerskin, Dog, Duck, Eagle, Fourmile, Franklin, Island, Julia, Kentuck, Laurel, Little Fork, Lone Stone, Long, Lower Nine Mile, Luna (Loon), Lynx, Maple, Medicine, Muskellunge, Otter, Pickerel, Planting Ground, Quartz, Rade, Rangeline, Rice, Round, Scattering Rice, Sevenmile, Silver, Snipe, Spirit, Three Johns, Townline, Upper Nine Mile, Virgin, Voyageur, Watersmeet, White Deer, Whitefish, Wiscon River and Yellow Birch lakes. More then just a book of fishing maps..... 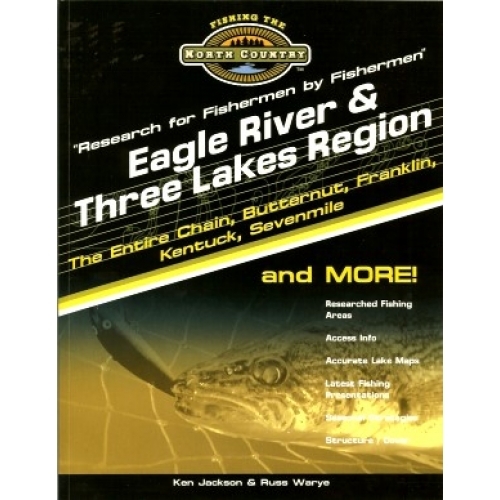 These books are "JAM PACKED FULL" of Researched Fishing Areas, Lake Access Information, Accurate Lake Maps Marked With The Best Fishing Spots, The Latest Fishing Presentations, Seasonal Strategies, Structure and Cover for each lake.